Hebrews 10:25 says, “Let us not give up meeting together, as some are in the habit of doing, but let us encourage one another—and all the more as you see the Day approaching.” We are here because Christians are called to gather together. What is the purpose of gathering? The purpose of gathering is simple: to receive Jesus Christ in Word and Sacrament. That’s it. That is why the term “worship” is not the best word to describe what happens when we gather. It places the focus on what we give to God rather than what God gives to us; and it is what God gives to us that saves us. So Lutherans have traditionally called this “God’s Service.” First of all, it is God’s service to us. Secondly, it is our service to God. Only after God has served us can we worship Him with our hymns, prayers, and gifts. But the highest way we worship God is to simply receive what He gives. He gives us Himself. Jesus is both Host and what is received. When you attend God’s Service at Living Word, you will find that everything we say and do points to Christ’s real presence among us. Only when we receive Christ, do we receive the eternal gifts that Christ won, namely, the forgiveness of sins, life, and salvation. God is indeed gracious toward us. How does Christ give Himself to us? Christ gives Himself to us in Word and Sacraments. 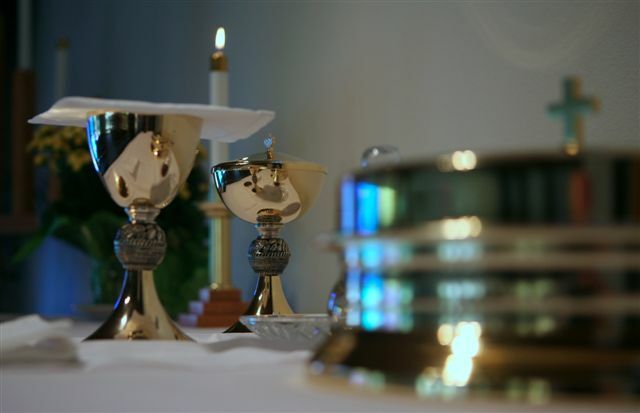 Therefore the liturgy revolves around Word and Sacraments. We have Scripture readings and a sermon based on those readings because Christ is the Word made flesh (John 1:14). So we receive Christ with our ears. We celebrate Holy Communion because He has promised that the blessed bread is His true Body and the blessed wine is His true Blood (Matthew 26:26-28). So we receive Christ with our mouths. Therefore every Sunday, and whenever else the Faithful gather at Living Word, the Lord Jesus Christ lavishes us with His eternal gifts and mercy. This wondrous mystery delights and humbles us in His presence. We invite you to gather with us to share this joy. For a detailed outline of God’s Service see The Explanation of God’s Service.